Looking For Affiliate Link Checker? Do you know you could be throwing away hundreds of dollars a month for not monitoring your affiliate links? Do you know that any vendors you are affiliated with can pull their products off the affiliate network at any time and not obligated to notify you? You won't be notified by the affiliate network itself either. By the time you get complaint emails from your customers, you have probably wasted hundreds of dollars in PPC (Pay Per Click) advertising with Google Adwords. How do you make sure that your vendor's site is up and running? You can manually click on your own affiliate links every day to make sure that they are still alive. But is this what you want to do? I am sure you have better things to do than clicking on your own affiliate links everyday. Besides, you might be promoting hundreds of affiliate links and it's simply impossible for you to check all your links daily (and it's downright tedious and boring, to say the least!). You can sign up for a regular site monitoring service, but all it checks for is that your vendor's site is alive. It doesn't really tell you if the vendor has removed their product from the affiliate network. If your vendor removed a product that you are promoting from the affiliate network and redirect your affiliate link to its home page, a regular site monitoring service will not catch that. The service only alerts you when your vendor's site is down. This can go on for months before you notice that your PPC or SEO efforts are not generating any affiliate sales. So, how do you monitor your affiliate links and keep your vendors honest? Here's where Content Site Monitor comes in. Our service is different from regular site monitoring service because it allows you to specify certain words or phrases to look for in a page. For example, if your affiliate link redirects to an iPad product at Amazon's website, you can specify "Apple iPad" as the phrase that you are searching for. Our automated process will ping your affiliate link and look for the phrase "Apple iPad". If it doesn't find that phrase, it will send you an alert email. You can then stop all your PPC campaigns for that particular affiliate link until the vendor fixes the problem. You will get another notification when the link is up again. Click here to get your 30-day free trial now! You can tell our system to check your affiliate links for you every 15 minutes, 30 minutes, every hour, every day, etc. You will sleep better knowing that your affiliate links are monitored at all time. Our system will send an instant notification to your email if your affiliate link is removed. There will be no more guessing on whether any of your affiliate links were removed or not. There is no need to install any software. Just log on to our site and provide us the URL where your affiliate link is located, the phrase or words that you expect to see on the page, and how often you would like the system to monitor the link. Before you become a paid member, we encourage you to open a free trial account with us. The free trial account is good for 30 days and you are allowed to monitor up to 3 affiliate links for free! You can opt to become a paid member anytime within the 30-day free trial period. Besides checking your affiliate links, you can also use our service to check your own websites, forums, blogs, etc. There might be outages at your web hosting company and you will have proof every time when it happens. You can forward the alert emails to your hosting company so that they can fix the problem. The alert emails capture the HTML page source whenever the expected phrase or words are not found. You will be able to pinpoint what the problem was from the error message stated in the alert emails. You can use our service to check back links that you placed on others' websites. When you exchange links with a webmaster from a different site for SEO purposes, won't you like to be notified when your link has been removed for no apparent reason? You can keep them honest by monitoring your back links without having to manually check them everyday. Our automated monitoring process will do all the work for you. Get a free trial account from us and try it out for 30 days. You can monitor up to 3 links for free. It will save you lots of money and headaches down the road. Although our website is very simple, we do rely on it to direct business to our Kampground. More than 40% of our reservations are made online and it is essential that our website is available at all times. We have used Content Site Monitor since the first day our site went live a few years ago and have been very pleased with its performance and reliability in reporting when our site was down. In most cases, our query to our web hosting provider concerning an outage proved to be the initial report of the problem. We are a media distribution platform and it is of the upmost importance for our operations that we are notified of any technical problems with our tracking links or advertiser landing pages. 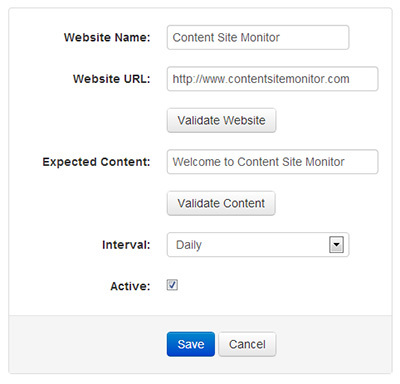 Content Site Monitor was easy to setup, cost effective, and delivers the service that we need. If for any reason you are not satisfied with our service, you can get a full refund by canceling your order within 60 days after your purchase.